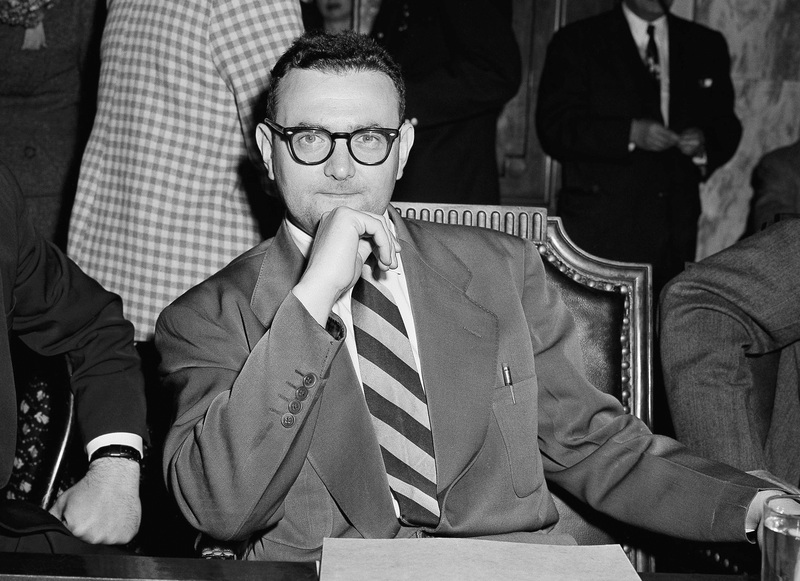 NEW YORK -- David Greenglass, a key figure in the biggest atomic spying case of the Cold War whose testimony -- later recanted -- sent Julius and Ethel Rosenberg to the electric chair, has died at age 92. Greenglass died in New York City on July 1, according to the Rosenbergs' sons, Michael and Robert Meeropol. Greenglass served 10 years in prison for his part in a plot to steal atomic secrets for the Soviet Union. His testimony was key evidence in the trial against the Rosenbergs -- his sister and brother-in-law. Decades later, in an interview with 60 Minutes II, Greenglass confessed to lying on the witness stand about his sister's role at the request of prosecutors. "As a spy who turned his family in... I don't care. I sleep well," Greenglass told correspondent David Morgan, adding that "stupidity" had kept the Rosenbergs from possibly saving themselves by admitting guilt. The Rosenbergs were convicted in 1951 of conspiring to steal atomic secrets for the Soviet Union and were executed at New York's Sing Sing prison in 1953, insisting to the very end that they were innocent. Greenglass, indicted as a co-conspirator, testified for the government that he had given the Rosenbergs research data obtained through his wartime job as an Army machinist at Los Alamos, New Mexico, headquarters of the top-secret Manhattan Project to build the atomic bomb. He told of seeing his older sister transcribing the information on a portable typewriter at the Rosenbergs' New York apartment in 1945. That testimony proved crucial in convicting Ethel along with her husband. In a 2001 book, "The Brother," Greenglass was quoted as saying he had not actually seen Ethel typing and knew of it only from his wife, Ruth. For the prosecution, however, the typewriter "was as good as a smoking gun in Ethel Rosenberg's hands," author Sam Roberts wrote. Greenglass was born in New York in 1922. After Army service in World War II, including the Los Alamos assignment, he and Julius Rosenberg became partners in a machine shop. The business failed; a Rosenberg attorney later claimed that led Greenglass to seek revenge on his brother-in-law. In fact, David and Ruth Greenglass, like the Rosenbergs, were active communist sympathizers, having joined the Young Communist League in 1943. Both couples believed that the Soviet Union should have the bomb if the United States did. At trial, the Greenglasses said Julius Rosenberg had recruited David Greenglass as a spy and arranged for him to feed stolen atomic research and a detonator to a go-between, Harry Gold. Gold also was later convicted. In 2001, Greenglass admitted to CBS News he was sometimes haunted by the Rosenberg case, but added, "My wife says, 'Look, we're still alive.'" He asserted that he lied to assure leniency for himself and keep his wife out of prison so she could care for their two children. Greenglass claimed he had been urged to commit perjury by prosecutors, among them Roy Cohn, later a key aide to anti-communism crusader Sen. Joseph McCarthy. Greenglass lived under an assumed name after being released from prison, hoping to be forgotten for his part in a McCarthy-era cause célèbre that is still furiously debated to this day. He remained estranged for the rest of his life from the Rosenbergs' sons, who were 10 and 6 when their parents were executed. The brother later took their adoptive parents' surname, Meeropol. If he ever encountered his nephews, Greenglass said, he would tell them he was "sorry that your parents are dead," but would not apologize for his part in their execution. "I had no idea they would give them the death sentence," he told CBS News. A spokeswoman for the Meeropols, Amber Black, said the brothers were aware of their uncle's death last summer but did not seek media attention and received no inquiries at the time.